Reading MAGNUS has been making music for almost 23 years in Polish ground seems no surprise; endless bands and musicians cut their teeth in the ‘underground’ scene in the underground in the Eastern Bloc (the former communist states in Eastern Europe), not given the slightest of chance to record/promote something for the whole world to know. It’s quite typical the vast majority of bands rising from countries such as Poland developed their career in the next two decades (90s, 00s). 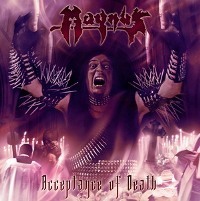 MAGNUS - still featuring two founding members in their ranks – delivered three full albums in the 90s and now strike back with a brand new effort pointedly called “Acceptance Of Death”. The style of MAGNUS lies in the early Death/Thrash Metal field. Imagine the time archetypal bands like ASPHYX or MORBID ANGEL shaped the old-school Death Metal prototypes, with evident links to the primitiveness of SARCOFAGO and early SEPULTURA, not forgetting to inoculate a Thrash Metal share of chaos from the HIRAX and SLAYER cookbook (it’s also token an IMPETIGO reference somewhere in their MySpace page). Some ‘weird’ groovy parts bringing to mind more modern Death(?) Metal scumdogs are also included. I see MAGNUS promoting both their classic-shaped offering and more up-to-date profile with this album; the songs have everything, from crawling paces to blastbeats with lunatic vocals exchanging parts with guttural takes set to fit the songs’ atmosphere. The way MAGNUS develop their songs is quite personal; you may find contradicting pieces in each song and this may even bring some smile regarding the tracklist’s coherence. Still, letting the CD age in your ears shall reveal an old band that’s surely confident for their new material. The vocal lines of Rob Bandit follow the same habit: he can initially startle you with his odd sense of theatricality floating allover the album but he surely hides some aces in his serious overall performance. The songs themselves bear this ‘classic’ Death Metal reek; in a total of less than 40 minutes with thirteen tracks piled, experienced traditional Death Metal enthusiasts shall get the idea anyway. Their nothing here to slam your face to the wall, that’s quite a fact, but at least you’ll have a tough time naming possible originals copied…and hardly any results. MAGNUS offers some good stuff here; the fact and only they still deliver Metal music after all these years is an added value. “Acceptance Of Death” smells dignity, too, and this shouldn’t go unnoticed. If you did not-typical songwriting in this genre please add one point to the total score.